Induced pluripotent stem cells (iPSCs) derived from patients with frontotemporal dementia were genetically corrected and converted to cortical neurons. The green staining indicates the cortical marker CTIP2, the red stain is the neuronal marker TUJ1, and the blue stains the nuclei of the cells. Credit: Susanna Raitano/Stem Cell Reports 2014. A new strategy for treating an inherited form of dementia has been identified after researchers attempted to turn stem cells derived from patients into the neurons most affected by the disease. In patient-derived stem cells carrying a mutation predisposing them to frontotemporal dementia, the scientists found a targetable defect that prevents normal neurodevelopment. These stem cells partially return to normal when the defect is corrected. The study appears in the December 31st issue of Stem Cell Reports, the official journal of the International Society of Stem Cell Research published by Cell Press. 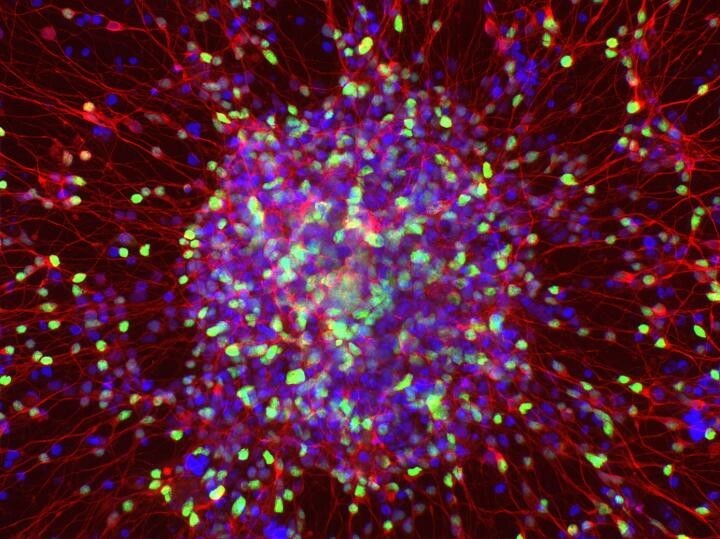 “Use of induced pluripotent stem cell (iPSC) technology”–which involves taking skin cells from patients and reprogramming them into embryonic-like stem cells capable of turning into other specific cell types relevant for studying a particular disease–“makes it possible to model dementias that affect people later in life,” says senior study author Catherine Verfaillie of KU Leuven.